The Imam Khomeini Airport City Company is planning to execute a mega air terminal project. 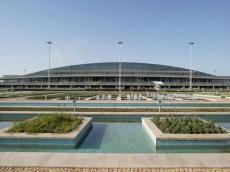 "Due to important role of aviation industry in economic development, the plan to build an air terminal with high capacity at the Imam Khomeini Airport City has been set on the agenda," said Managing Director of Imam Khomeini Airport City Company Kourosh Fatahi after his meeting with Deputy Minister of Roads and Urban Development, Trend reports citing ILNA. He noted: "The company ran an international call for applicants to design and construct the Iran-Shahr air terminal; 34 foreign companies expressed interest in the project, while in the end, four foreign and four domestic companies were chosen to cooperate on the project." "The air terminal will have an annual capacity of 25 million passenger arrivals and departures in the first phase and in the final phases this will reach 100 million passengers," he said. Meanwhile, Deputy Minister Shahram Adamnejad noted: "The Imam Khomeini Airport City is important not only for Tehran, but for all the country and special attention should be paid to it."